If you are concerned about your privacy and fear that your online activities may be monitored by your ISP, the government and criminals, the bad news is that you are not being paranoid. The truth is that defending our right to privacy is difficult in a world where ISPs, governments and large corporations can keep trace of everything we do online. In addition, cybercrime is a very real threat and anyone can become a target of malicious users who seek to steal your information. The good news is that with the help of a good VPN service, you can regain your trust in the internet and enjoy all its benefits, without compromising your privacy and security. Trust.Zone is a provider that focuses on keeping your connection secure, giving you peace of mind while you browse websites and use online applications. Based in Seychelles, Trust.Zone offers features that will help you to remain anonymous and to defend your privacy. It also enables you to defeat online censorship and blocks, giving you freedom to access online content. Trust.Zone is committed to keep your internet connection secured, using a high level of protection. Whether you are at home, or using public Wi-Fi at a coffee shop or airport, Trust.Zone defends you from online threats and ensures that your online activities remain private. OpenVPN and L2TP/IPSec are the protocols available and while both secure options, if you want the best in terms of security, OpenVPN is the best choice. This open-source protocol is known for its reliability and strong protection, while L2TP/IPsec is a convenient solution for mobile devices. When you connect to a Trust.Zone server, your connection is protected with strong encryption. They AES-256-CBC cipher with SHA256 authentication and RSA-2048 for handshake. These are high standards that will help to keep security threats at bay. Trust.Zone takes privacy very seriously and since the provider is based in Seychelles, it is not within the jurisdiction of surveillance agencies like the NSA and it is not subject to data retention laws. This allows them to offer a solid no logs policy that ensures that your online activities are not recorded or monitored. They only keep track of the amount of data that is transferred, but this is done for maintenance purposes and to ensure that the free trial (which only offers 1GB) is kept within the usage limits. No other logs are kept and even if a legal request is received, Trust.Zone will not be able to associate it to a specific customer. DMCA notices are handled internally, without compromising the identity of their customers. Furthermore, Trust.Zone has a warrant canary in place as an additional measure to help customers to protect their privacy. The warrant canary would alert users in case Trust.Zone is forced to monitor activity following a warrant, or if the servers are seized by authorities. In addition, when you sign up for the service, you are only required to provide your email address and Trust.Zone accepts Bitcoin, a method of payment that will allow you to remain anonymous. 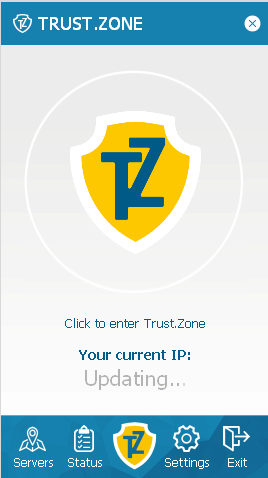 Trust.Zone offers software for Windows, which means that users of this platform will be able to install the VPN easily and run it on their devices with just one click. The interface of the software is simple, but it offers a great selection of features including Kill switch, Auto Retry Connect and Auto Location Select. The Kill Switch will prevent that your real IP address is exposed, even if the VPN connection drops because it blocks all outgoing internet connections. In case the VPN connection drops, it will be restored quickly and automatically thanks to Auto Retry Connect. In addition, you will be able to change a VPN port with a single click. Port 21, 22, 80 and 443 are some of the options supported. You can also set up Trust.Zone on macOS, Linux, Android, iOS and other platforms, with the help of the guides available for customers. While manual configuration can take a bit longer and we hope that Trust.Zone adds dedicated clients for more platforms in the future, the set up guides are very helpful and will take you through every steps of the process. Although Trust.Zone is relatively new in the market, it already offers an extensive network. Currently, it is possible to connect to over 100 servers in more than 30 countries. You can switch between servers as many times as you want and there are no bandwidth limits. The speeds are very good in general and you shouldn’t have experience significant delays in activities that require fast performance like streaming or downloading content. Since Trust.Zone doesn’t block any kind of online traffic, you can use P2P securely. There is a free trial that allows you to check the service for up to 3 days. It only supports one device, doesn’t allow access to all the server locations and the data transfer is limited to 1GB. However, it is a convenient option to test the service before purchasing a subscription. Once you have tested the service, you can opt for a paid plan, which gives you access to all the locations available. In addition, there are no data transfer limits and you can have up to 3 simultaneous connections. One month of Trust.Zone costs $6.99, but as usual, you can get good discounts when you increase the length of the subscription. When you pay for three months in advance, the monthly price is reduced to $4.95 and currently, if you choose an annual subscription, the price per month is just $3.33. Trust.Zone has a 10-day money back guarantee, but keep in mind that you are only eligible for a refund if your bandwidth usage is less than 1GB. The payment methods accepted include cards, Alipay, PayPal, bank transfer and Bitcoin. Paying with Bitcoin crypto-currency also provides an additional 10% discount on checkout. Trust.Zone’s website has an extensive FAQ section where you can find a great deal of information about the service. There is also a blog that features articles about online privacy, different aspects about Trust.Zone and guides that will help you to get the most out of the VPN service. Customers can also go through the troubleshooting section in case they come across any issues and if they need additional help, they can reach Trust.Zone via the web form. Support is available Monday to Friday from 6 AM to 6 PM GMT.